…plus quite a bit of baseline running this summer which I’m sure helped me more than the ice cream– but I don’t have a photo of that to share. In the last week I have consumed more ice cream than I have over the last two months of summer combined, and I enjoyed every delicious bit. 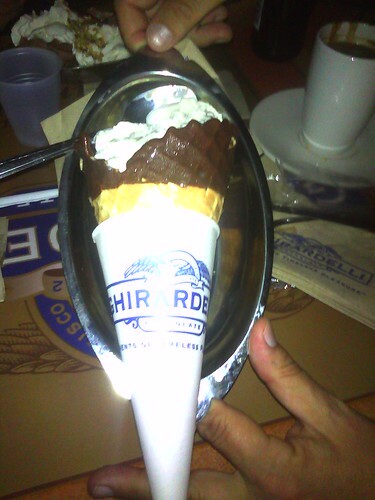 This gigantic cone is from the Ghirardelli Ice Cream Shop at Downtown Disney (WDW, Orlando, FL). Alas, I couldn’t finish this chocolate dipped waffle cone of butter pecan goodness because it was way too much apparently my stomach is too small to handle the perfect amount of ice cream. My first half marathon recap: The morning of the race, I got up early and arrived at the parking structure by 4:15 AM. At 6 AM the race began and I ran with almost 12,800 runners, with 62% of them other women. We were placed into one of seven start corrals based on ability (A.k.a. proof of time from a previous qualifying race of 10K or longer). Determined focus: I started in Corral D which the announcer dubbed “Determined.” I was determined to finish this race with a time of under 2 hours and 15 minutes and I would not have been able to do that without focus. That Steve Jobs quote above applies to this race, as it was a challenge made up of many little challenges. Water– In my previous longest race (10K) I stopped at every single water station, which was unnecessary. This time I carried a bottle with me and only stopped for Accelerade once at the first water station. Carrying the bottle with me wasn’t much fun because I kept it in a pocket of a jacket that was secured “fanny pack” style tightly around my waist. This made it a pain to take out, but I didn’t really drink much until the latter part of the race anyway. Knowing that I already had hydration on me helped me power right on through those stations where runners all around me slowed down and stopped to grab cups. Restrooms– These were everywhere along the course and very tempting too. I found my brain convincing me that if I stopped for a couple minutes then I’d feel better and be able to run even faster. Then again I also knew that womens’ restrooms have notorious lines and that it would likely take more than the couple of minutes I was considering sparing. Every time I passed one I had to force my eyes back on the course and not follow the trail of runners veering off toward them. I knew, of course, that I just had a case of nerves and when I finished the race I wouldn’t have to go at all. Road hazards– I saw one runner take a spill on my left while running through Storybookland in Disneyland. I, myself, had to be very careful of railroad tracks and the raised reflectors in the road. I found while we were running down the streets that I had a tendency to run close to the middle, usually directly on the lane lines except when turning the corners when I cut very close to the raised curbs. Sometimes I’d jump onto the sidewalks to pass other runners and hop back down into the street afterward. This could have ended very badly with one misstep. Fortunately I didn’t get a case of the clumsies even during a race that started at 6:00 AM. Character/ location photos– Lots of characters were out and posing with runners. I saw a huge line for Darth Vader. It was novel to take photos at Disneyland during the race, but at the same time we were in a race so I kept running. Sideline distractions- there were many high fives offered, music played, cheers from h.s. cheerleaders, and homemade signs encouraging the runners. I gave a few high fives, but then I moved toward the middle of the street again so I wouldn’t be tempted to stop and chat or else seem rude for not returning the offered high fives. Chocolate– My one big time concession was near mile 9 where they gave out Clif gels that were offered with one shout, “Chocolate!” I slowed to grab a pack figuring “Why not? I could use a boost of energy,” but I couldn’t open the little package very easily while running so I slowed down a bit more. It was worth it though, because once I sucked it down I felt like I just licked the spoon of some rich brownie batter and all was right with the world. I tossed the empty breakfast of champions sleeve into a bin and entered Angels Stadium. At that point I felt good so I picked up my speed, especially once I started hearing that we were only ‘x’ distance away or ‘almost there’ from people on the sidelines. I passed a number of people by drafting off of those who’d just passed me and were weaving their way through the exhausted runners ahead. Doing that meant I didn’t have to think about path as much as just moving quickly into their wake until I saw the finish line. My results: My goal was to run this in 2 hours and 15 minutes or less. Results explanation: Half marathon distance is 13.1 miles. Clock time is measured from the start of the race. Chip time is measured from the time that I physically crossed the starting line to physically crossing the finish line. Overall and gender place categories are self-explanatory. Division place is where I ranked among the other women in my age group. Not sure what the age grade is all about, but apparently I’m in the dead center of the pack on that. Yay, me. Below that you have my splits for the 5K (00:34:02– started with a 10:57 min/mile pace doing 3min r/1 min w intervals until the crowd thinned out enough to just go for it), 10K (00:30:32) 15K (00:30:37), plus the homestretch 3.8miles (00:35:20– for a decent finish at a 9:18 min/mile pace). I’d never run a race that long and half-expected to poop out by mile 8. I found that I was able to maintain a consistent pace right on track with the 3 to 5+ mile pace training runs I’ve done with the tri team running group all summer. Pretty amazing! 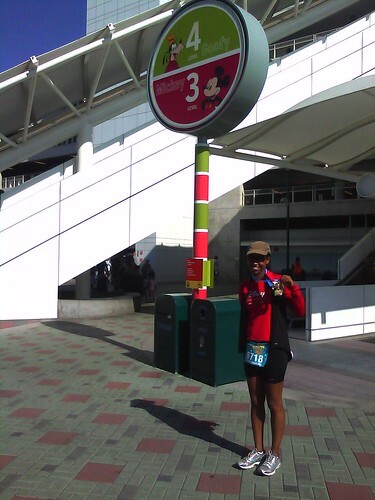 Here’s my Disneyland Half Marathon obligatory ‘look at my shiny new medal’ pose. A year ago running a half marathon sounded as crazy to me as running a full marathon does to me now, but with the overwhelming amount of support I’ve had this summer and this weekend, and with the right amount of focus– and enough peer pressure in the case of a marathon sign up campaign– I feel like I can accomplish whatever challenge I choose next! I’m glad this one turned out well. I’m already signed up for another half in late January (Tinkerbell Half Marathon), same place. Next events: For my LA locals, here are a couple more fun activities I’m looking forward to this month. If you’ve read this far, that means your eyes have just read a half marathon. Congratulations, and thanks for reading!